The Chicago Blackhawks didn’t exactly head into the Christmas break the way they wanted. They lost to the Dallas Stars this past Thursday. It was an important game against a division foe; the third game against them, mind you, two of which have been close losses. They should have been psyched for it. Instead, they got shut out 4-0. Ouch! But that was only the beginning. The Hawks answered back with a very mediocre response to the New Jersey Devils on Saturday, losing 4-1. This is a far cry from the five-game winning streak discussed last week. Yep, this is the current state of the Hawks. Merry Christmas, everybody. It is what it is right now. Let’s get to our weekly updates. It would be easy to highlight Patrick Kane here. After all, he did acquire NHL goal No. 300 for his career. But that would be too easy. Besides, he was the winner last week. It’s very hard to pick a winner, because the Hawks as a whole and individually are so inconsistent these days. A player appears good one game, and then in the very next contest he’s ineffective. 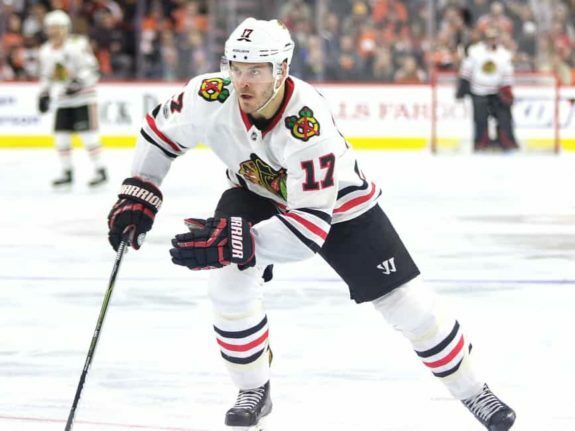 Jonathan Toews and Brandon Saad can’t seem to put anything together offensively on the first line, and their third linemate keeps getting changed. 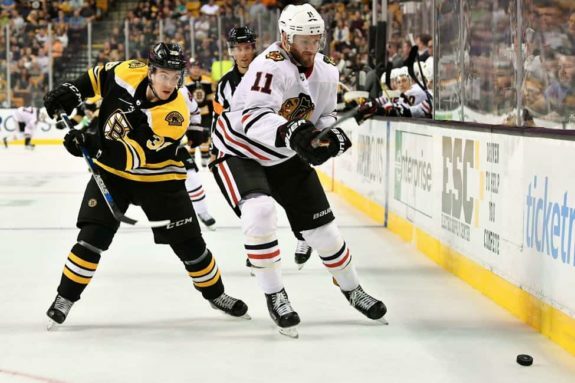 Nick Schmaltz and Artem Anisimov are struggling to make it work with Kane on the second line. Alex DeBrincat was recently demoted to the third line, and Patrick Sharp and Ryan Hartman are more moving parts. Meanwhile, the fourth line of Lance Bouma, Tommy Wingels, and Ryan Hartman are the most consistent line out there. They’re not necessarily there to score, but to provide energy, to eat up important minutes, and be hard to play against. This week, the winner is Bouma. He put in over 13 minutes of ice time against both Dallas and New Jersey, which is pretty high for a fourth-liner. In Dallas, he played 1:55 minutes on the penalty kill. In both games combined, he recorded two shots on goal and seven hits. Heck, he even got a few shifts on the first line in New Jersey. It might not seem like much, but it’s obvious Coach Q trusts Bouma in his role. He’s solid defensively and he’s encouraged to take part offensively as well. Bouma is consistently holding up his end of the bargain by being responsible and playing a physical game. Hopefully he can keep it up. No, we can’t just pick the whole team, although it’s tempting. Cody Franson last suited up for the Blackhawks on Dec. 8 against Buffalo, where he sustained an unspecified upper-body injury. It was determined he was healthy enough to play last Thursday against the Stars, but he hasn’t seen the lineup yet. Coach Q indicated he wanted to give Franson more time to recuperate, but this coincided with Jordan Oesterle playing very well in Franson’s place. The injury is bad timing for the veteran defenseman. Jan Rutta was in the same boat as Franson last week, where he could have played but didn’t. Yet he did draw back into the lineup against the Devils. It appears Franson is the odd man out, for now. Oesterle hasn’t played all that great these last two tilts. Both games were losses, indicating a lineup change could be imminent. Perhaps Franson will get another chance on the upcoming road trip. Well, as I mentioned earlier, there’s the Kane thing. We should cite that backup goaltender Anton Forsberg filled in admirably after Corey Crawford gave up three goals on seven shots in the first period against the Devils. Forsberg ended the night with 21 saves on 22 shots and a .955 save percentage. And how about that lovely second frame on Saturday night where the Hawks controlled the play and outshot the Devils 22-7? Yeah, that’s all I’ve got. The Hawks can’t put together a full 60 minutes of hockey for the life of them. They can look really solid for a period, sometimes two periods. Heck, every now and then those two frames are one right after the other. Hey, 40 minutes of good hockey. But a full 60 minutes just seems to be more than the Hawks can muster. Why is that? Is it because the coaching staff keeps changing the lineup so the guys can’t find their groove? 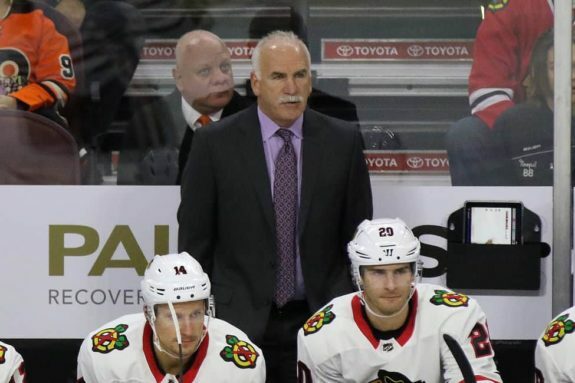 No, Coach Q hasn’t really been tinkering that much of late. Is it their lack of drive and determination? It’s hard to stay motivated throughout the grind of a long season, especially right before a holiday. But the Hawks have had this problem all season long. They show flashes, but they aren’t consistent. Or is it because they simply aren’t very good and Q is running out of answers? Is it that the core is aging, and the complementary parts aren’t talented enough to fill in the gaps? Nobody wants to hear it, but it’s starting to look more and more like this could be the case. Time will tell. The Hawks are now 17-13-5, with 39 points. They sit outside of a wild-card spot in the Western Conference. In their division, they currently rank fifth out of seven teams. As they head into their 36th game, time is running out. They need to string together some consistent play and start winning games if they want to see the playoffs in the spring. The Blackhawks have a tough road trip ahead of them. They meet the Vancouver Canucks and then the Edmonton Oilers this Thursday and Friday. On New Year’s Eve, they take on the Calgary Flames. Next Wednesday, the Hawks travel to play the New York Rangers before finally heading home to host the Vegas Golden Knights on Friday, Jan. 5. None of these teams will be easy to beat, especially on the road. But at this point, the Hawks need to approach every game with a must-win mentality. Never a dull moment.